In the mid-1980's, the sculptors at Citadel hit upon a winning formula for making miniatures that gripped the imagination. In my view, the key to painting these minis is to understand this formula and exploit it. What is this secret sauce? Keep it simple. Add one twist to give the miniature flavour. But one twist is all you need. For example, take the classic Chaos Hounds by Aly Morrison (1987). Even your grandma knows that Hounds of Chaos must be mutated, and obligingly, these dogs have spines, two heads and ebola. But each dog has only one mutation. Other than that, they are clean models. Absent are the layers of neck flaps, spikes and scales that festooned all the later iterations of chaos hounds. However, there is something else: in addition to each model's single mutation, there is one little twist. All the dogs are thin. Painfully thin. This simple, unifying detail makes the models stand out, and suggests a sinister idea to the viewer... these dogs are very hungry. In order to paint these dogs properly, it's important to highlight the idea of thinness. 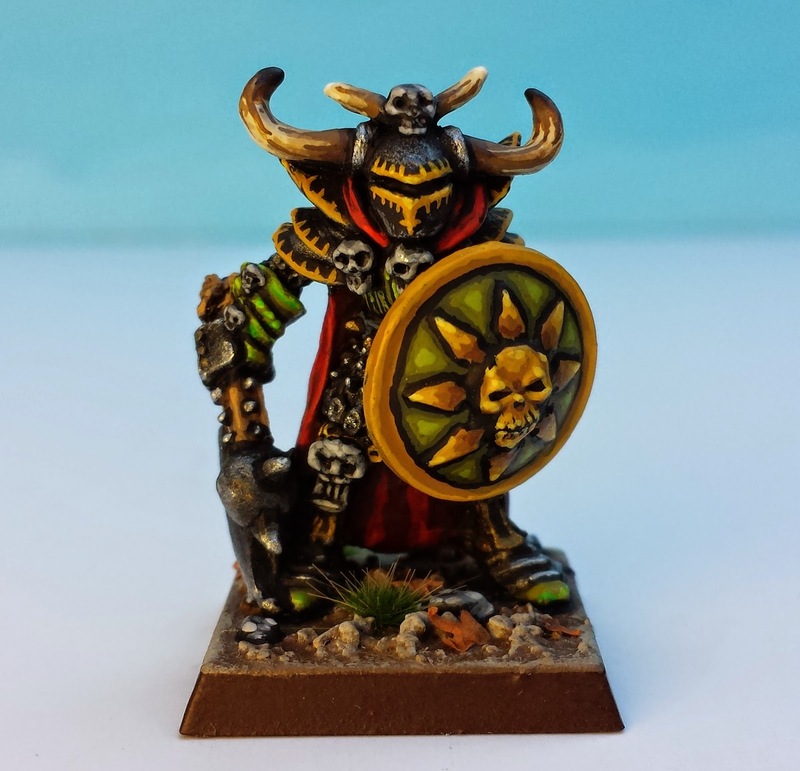 So I used a very aggressive highlighting technique without too much blending in order to make their bones stand out as much as possible. 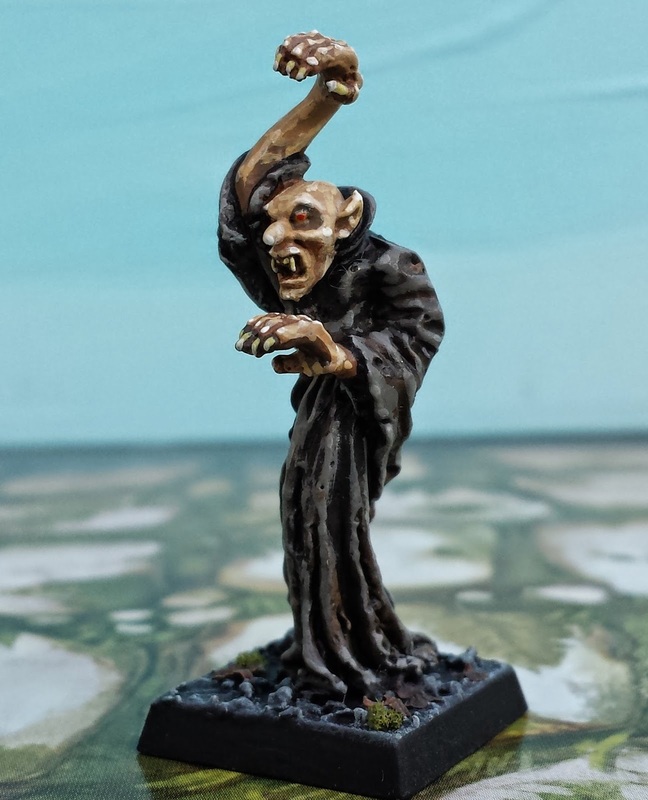 I didn't want to distract from the idea of starvation, so I kept other flourishes to a minimum: the skin colour isn't particularly supernatural, the eyes are dark and the teeth modest. It's a simple approach, but it builds on the underlying idea of the miniature. The "Vampire Attacking" (1986) from the Night Horrors range is another great example of Citadel's approach to sculpting. The vampire itself is clearly modeled on Max Schreck's Nosferatu and so features exactly what you'd expect: an elongated skull, large hands and a feral grimace. But on top of all of this is a beautiful twist: the model is reared into an S-shape, almost like a snake. It's a simple detail, but it gives the monster a haunting silhouette, just like the original Count Orlock. "Is this your wife? What a lovely throat." I'm not sure why, but I've long harboured the suspicion that Games Workshop held secret sympathies for the American right wing. I'm not sure why. 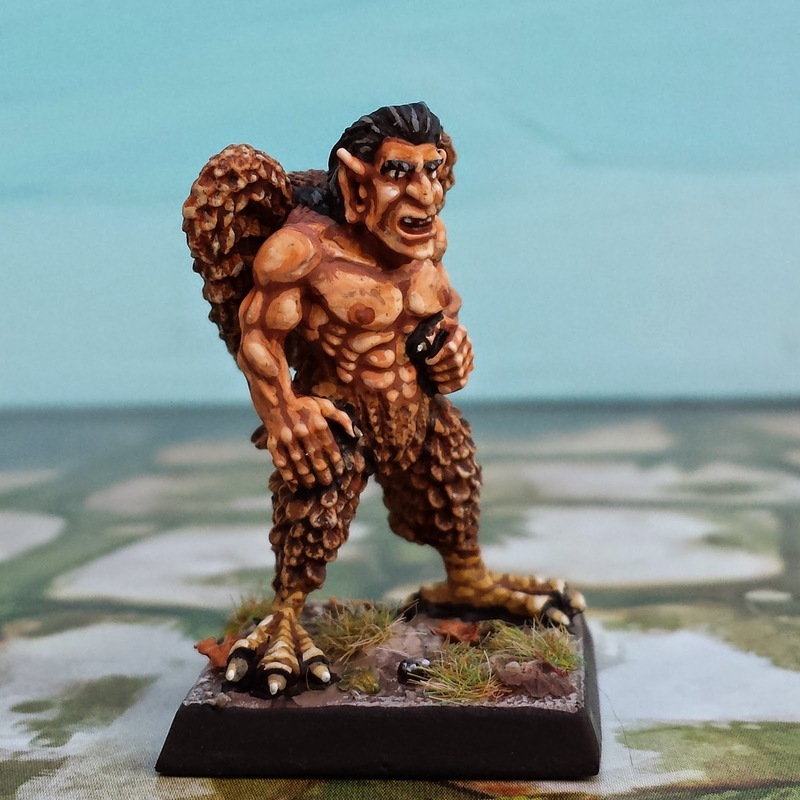 In any case, I was delighted when I went to paint the male harpy by Iron Claw (Bob Olley, 1990?) and realized that he was the spitting image of Ronald Reagan (or maybe the spitting image of the Spitting Image of Ronald Reagan). Painting him to look like the Gipper wasn't hard - I just gave him luxurious black hair and a vacant stare. In sum, a defining characteristic of Oldenhammer miniatures is a simple, clean sculpt. 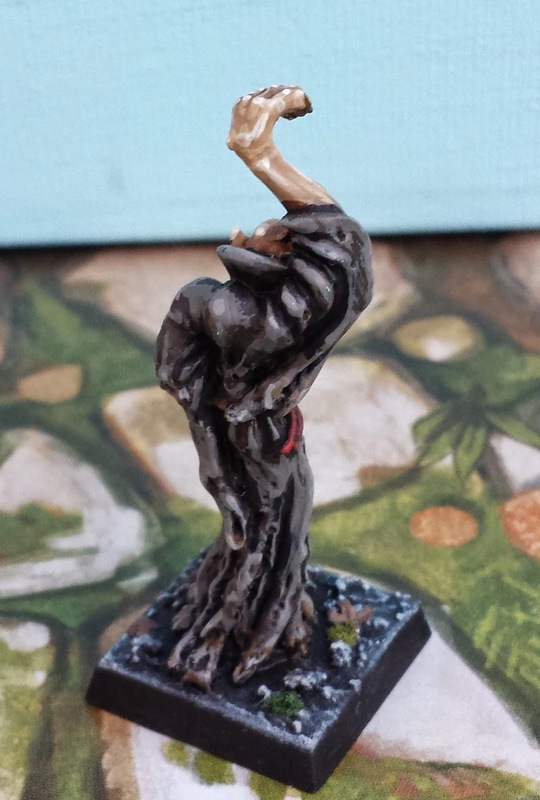 These minis are never cluttered with details, but there is usually one stylistic flare. My philosophy is that painting should highlight this flare, and should otherwise stay simple too. 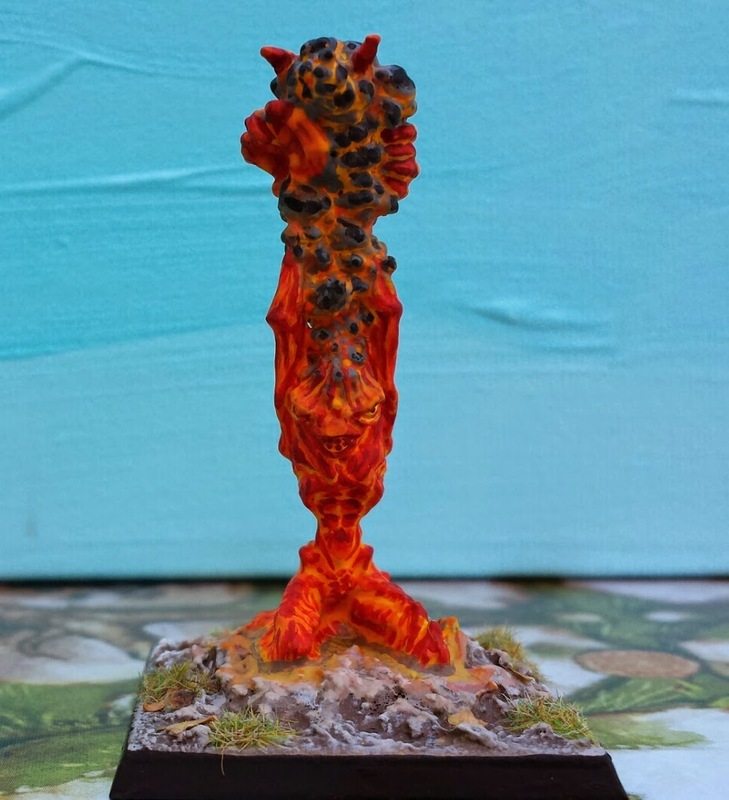 As a last example, I offer up this citadel Fire Elemental (Nick Bibby, 1985). I love the way its stretching arms are entwined in the column of smoke billowing off its head. Simple. Odd. Beautiful. "What hand dare seize the fire?" Another of the harpies is our own Mrs T. Somehow the both of them portrayed as harpies seams right. Nice minis, you should ask Bryan on the google + community if it was indeed their design philosophy or just chance that gave rise to the sculpts we know and love. From which issue of White Dwarf is the drawing with Reagan? Erny - I didn't realize that the female harpy was the Iron Lady. Brilliant! And forgive me being thick, but is Bryan Ansell on the google + community? I'd be very curious to know if they had a design philosophy in those days, and if they did, how he would put it into words. 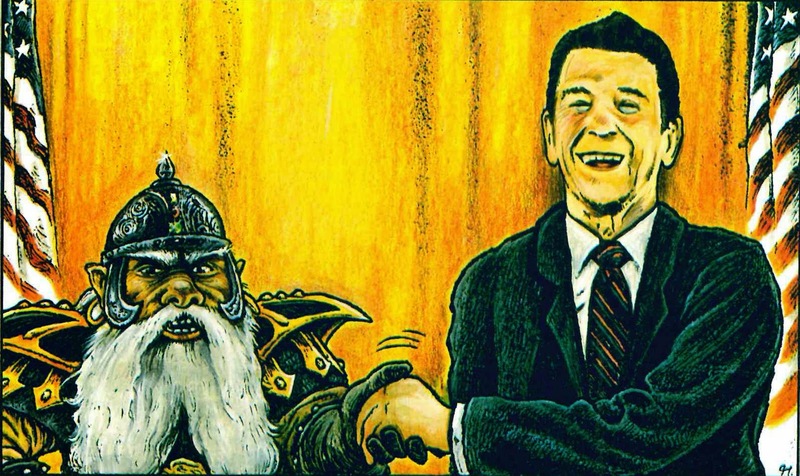 Toco - the Reagan illustration is from White Dwarf #93, Sept. 1987, an ad called "Thank You, Mr. President". The "one twist" approach you identified reminds me of the long-standing rule of men's fashion: "Wear two plains and a fancy." It cuts a fine figure at any size.